Today’s top manufacturing companies gain a competitive advantage when they harness data and turn it into actionable insight. But how do you join them at the top? In this white paper, discover how an integrated approach to data collection, presentation, and analytics has the potential to increase business value, and place today’s manufacturers in a better competitive position. 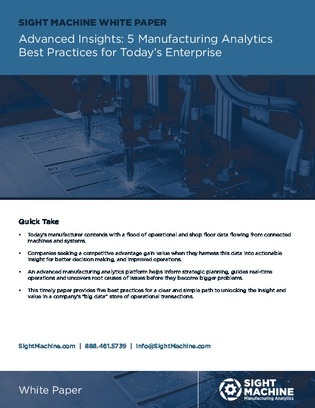 To learn how you can join them at the top, download this white paper, and discover the 5 best practices proven to keep your manufacturing team at the top of their game.